Showing 23 articles from November 4, 2014. With a full compliment of city council members and department heads, save Fire Chief Todd Strozyk who was away for training, the Raymond City Council held two Public Hearings, passed a tax levy, approved their consent agenda in a lengthy 10-minute session, Monday night. The Olequa Senior Center will be holding their annual Holiday Bazaar this Saturday from 9 a.m. to 4 p.m.
With 20 vendors booked for the event, items suitable for birthdays, anniversaries, decorating and Christmas will be available, as well as lunch from the kitchen. Proceeds from booth rentals and lunches will benefit ongoing Senior Center activities. The fourth annual Lewis County Veterans Day Parade is set to take place this coming Saturday in Toledo and all members of the local community are invited to attend. Scheduled to start at noon, the parade will travel down Augustus St. and end at the Veterans Wall of Honor in Kemp Olson Memorial Park. A special presentation after the parade will take place at the Wall of Honor, including an invocation and messages from area veterans. 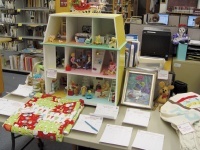 The Winlock Timberland Library has announced the approach of their annual Artisan Silent Auction and donations of locally-crafted items are being gathered before the Auction begins next week. Taking place for the seventh year in a row, the silent auction serves as a major fundraiser for the Friends of the Winlock Timberland Library, and last year's event raised a record $1,700. This year organizers are hoping such support can continue, and community members are being asked to help by providing auction items. Why do they change the time on a Sunday? Or any other day when folks might like to sleep in? (Or at all...) So instead of getting to do just that, my brain and body are awake an hour earlier than the clock. Boring... To paraphrase something I saw on the Internet: The Old Indian said, "Only the white man would believe you can have a longer blanket by cutting off one end of a blanket and sewing it on the other end." Since I only have two clocks that need to be manually changed, I did that right away only to find that the atomic clock hadn't done it's thing before 10 o'clock - or was it 9? Or 11? If you've ever read anything on how time was kept prior to the railroad, I guess we should count ourselves lucky. Thursday Toledo Garden Club meets 1:30 p.m. at Presbyterian Church. Saturday at Senior Center Second Saturday Breakfast 7:30-10 a.m. offers Endless Hotcakes plus eggs, ham or sausage, juice and bottomless coffee accompanied by many of the area's historians, just $5. Contact Diana, diana.haug@lewiscountywa.gov or (360) 864-2112. Resident Lois Wilson is inviting community members to celebrate the 93rd birthday of three local residents, who all have their birthdays within a few weeks of each other. Betty South had her birthday on Oct. 29, while Marie Chastain will be turning 93 on Nov. 15, followed by Louella Wilson on Dec. 14. "They're cool ladies, every one of them," said Lois, adding their longevity "proves that the water in Vader is good." The Toledo Community Library is working with the Toledo Historical Society to create a "History Room" which will house microfiche newspaper articles and two display cases. About 70 people were in attendance on Oct. 21; as Sally and Chuck Caley presented highlights from their three month hike of the Crest Trail. Pam McEachern is going to a Genealogy presentation on Nov. 18, and Story Time continues every other Wednesday. The Toledo Elementary School Garden science program is off to a good start with several parent volunteers and sessions regarding watershed protection, composting and vermicomposting headed by Bob Taylor. November sessions involve reduce, reuse and recycle and outside bulb planting is planned. There is something about living in a small town. When I lived in Seattle I would constantly get teased about being from Winlock. I can remember the big city folks giving me a hard time about being from the town where our claim to fame is The Worlds Largest Egg. I thought it was time to include a few jokes about living in a small town. A numbers of local issues faced resounding approvals or defeats during the 2014 General Election, including the annexation of Winlock into the Timberland Regional Library District, which is passing with more than 70 percent; approval of an EMS levy for Lewis County Fire District 15, which is passing with more than 76 percent, and the defeat of a bond measure for the Toledo School District, which is receiving more than 62 percent disapproval. The Toledo City Council has voted to temporarily close Kemp Olson Memorial Park as of Nov. 8 due to concerns winter storms could cause unsafe trees and limbs to fall. Discussed during the council's Nov. 3 meeting, officials decided the park should be closed for all uses in light of the potential hazards, stating the closure will begin after the Lewis County Veterans Day Parade concludes this Saturday afternoon. Winlock has begun looking at options to contract out police services as a way of reducing city expenses, and have so far ruled out the Lewis County Sheriff's Office as a possibility. First proposed during the council's Oct. 27 meeting, Council Member Aaron Mummert said depending on a nearby agency for law enforcement rather than Winlock's department could free up a significant amount of money in the city's general fund, as a preliminary proposal for the 2015 budget includes $252,000 set aside for police services. Willapa Valley qualified to the State cross country competition for the first time since 1994 with a fourth-place effort at district. Castle Rock just couldn't answer Kalama score for score and paid the price. CR allowed 396 of offense to the Chinooks, but Chris Millward scored a 20-yard TD early. Talib Meeks score the second TD for the Rockets to keep hope alive before the Chinooks scored twice more. QB Mason Klingberg ran 20 yards for the final CR score. A breakdown of recent local games for the week of Nov. 5. The Lewis County Sheriff's Office and United Way of Lewis County are now accepting applications for their annual Shop with a Cop Program, which takes disadvantaged kids and their immediate family on a shopping spree in time for Christmas. Open to Lewis County children attending 2nd through 12th grade, the program is available to one child per family, though applications for multiple children in the same family may be submitted, and those who participated last year must wait until next year to apply again. The deadline to apply is Nov. 28 by 4 p.m., and families selected for the program will be notified by Dec. 5. Lewis County has announced the first restriction of a roadway due to flood conditions during the 2014-2015 flood season. A section of Teitzel Rd. near the bridge over South Hanaford Creek, east of Centralia, is restricted as of 2 p.m. Nov. 4 due to water over the roadway, which has been described as "passable" but still hazardous. This is the first of multiple expected roadway restrictions and closures during coming months as a result of winter flood and storm conditions, and updates may be accessed at http://roads.lewiscountywa.gov/. Authorities are seeking information regarding a burglary taking place near Winlock sometime in recent months. Between Aug. 29 and Sept. 2, an unknown number of suspects entered a residence on the 300 block of Avery Rd. W. and stole two gold wedding bands, including one with a diamond engagement ring welded to it. The estimated loss is $4,000. Law Enforcement Officers throughout Lewis County attempted 199 warrants Oct. 30 as part of Operation DV Roundup. The special warrant sweep was coordinated to locate subjects who have outstanding warrants for domestic violence related crimes as October is Domestic Violence Awareness month. "We are sending a strong message that domestic violence has no place in our community," said Lewis County Prosecutor Jonathan Meyer, stating one in four women age victims of domestic violence during their lifetime. "This warrant roundup is an important reminder to those who choose to commit these acts, that the victims, the police, and this office will not simply turn a blind eye to their violence." The Lewis County Sheriff's Office is seeking a suspect charged with animal cruelty after he has failed to appear for multiple related court hearings. Jessie G. Pegram, 21, of Ethel, had been arrested in November of 2012 for allegedly punching a five-month-old German shepherd puppy in the face, with deputies being told he had also thrown the animal against a tree. When he was arrested on the 100 block of Oyler Rd., he was described as intoxicated, and a veterinarian exam of the puppy revealed he had suffered injuries consistent with witness statements regarding the incident. A Toledo man has opened up a new liquidation store right downtown and has already been met with enthusiasm from residents glad to see another store filling the gap after the recent closure of Sunshine Liquidators. Royce Lawyer, owner of Royce's Groceries and Liquidators, located at 119 Cowlitz Way, said he decided to open the store at the end of last month both as a way to remain active as a businessman and also to provide low-cost shopping options for local residents.